Inverell motorcycle sport club motocross complex is conveniently situated on the town out skirts on the Ashford Rd. The track is laid out in a man made amphitheatre, providing spectators with ample viewing of all the action. The club has worked hard to provide riders and spectators with toilets, showers and canteen facilities. The main track is 1.5km of chocolate loam and is ploughed and watered before each race meeting providing excellent track conditions in all weather. Laid out within the main track are the juniors and nipper tracks The track was built to provide riders of all levels with good combination of left and right corning into table tops and open woops sections. 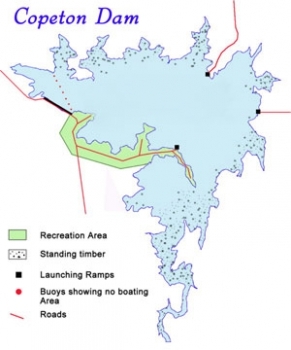 Copeton Dam is almost 3 times the size of Sydney Harbour when full and is surrounded by recreation areas. it lies to the south west of Inverell and access can be gained from the Gwydir Highway, where the turnoff is very clearly marked. Access can also be gained from Bundarra and Bingara, with both roads converging before reaching the southern end of the dam. See the location map for more details. It is the most popular holiday and day spot around , the lake boasting some of the finest facilities in Northern NSW. Hot showers and amenities blocks are scattered throughout the 939 hectare park and campers are able to enjoy a free form style of camping. A kiosk and laundry are located within the park and there are 76 powered camping/ caravan sites. Spectators get a spectacular view of the natural terrain motorcross action from the rocky hills overlooking the many and varied below waterline tracl layouts that can be used. 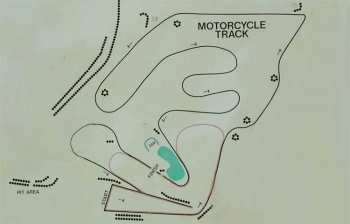 The motorcross track also becomes an intergral part of the exciting cross country course. the challenging layout features a huge selection of sections ranging from fast, open trails to slow and gnarly technical sections that riders of all skill levels will enjoy.